Mosques in Peterborough gave residents the chance to learn more about Islam at an open day this weekend. The Masjid Khadijah and Islamic Centre in Cromwell Road, Peterborough was one of the Mosques to open their doors on Sunday as part of the national #VisitMyMosque campaign to encourage people to learn more about the religion. 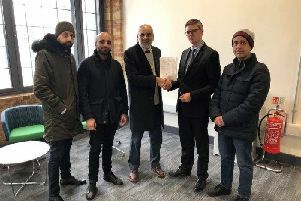 Visitors to the mosque included Peterborough City Council chief executive Gillian Beasley, and the guests were able to see the congregation praying, as well ask questions to staff and volunteers. There were also a series of information boards set up around the Mosque for people to learn about the history of Islam, and about some of the community work carried out at the Peterborough mosque. Food was also served to the visitors.